Congratulations to Andrew Davies who has been selected as a Young Citizen of the Year for 2018 by Rotary International Great Britain & Ireland (RIBI) for his inspirational fund-raising in support of Sheffield Children’s Hospital. He has now raised nearly £140,000 of his £150,000 target. 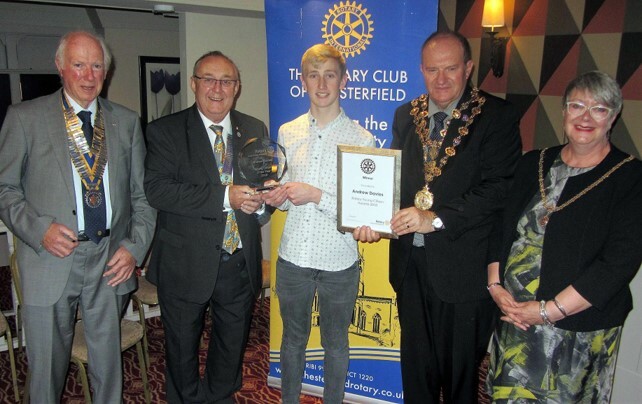 The prestigious award, along with a cheque for £500 towards his charity, was made by Rotary district governor Michael Longdon, on behalf of RIBI National Rotary president 2017-18 Denis Spiller, at the Chesterfield Rotary club meeting on Friday 25 May 2018. Also in attendance was the Mayor and Mayoress of Chesterfield, Cllr Stuart & Anne Brittain, and Chesterfield Rotary president Peter Barr. Remarkable young people from across Britain and Ireland are recognised with Rotary Young Citizen Awards. 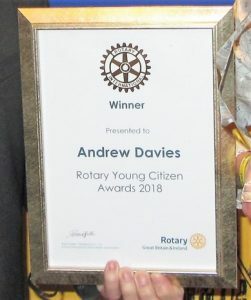 The accolades celebrate the positive citizenship and responsibilities that are shown by many young people through hard work, inspirational ideas and a determination to help others. In September 2012, Andrew Davies, who was only 13 at the time, became very unwell. He was referred to Sheffield Children’s Hospital where he was diagnosed with acute myeloid leukaemia, a rare and a rapidly spreading disease if not treated quickly. Over the following months he endured courses of chemotherapy and a bone marrow transplant. Thankfully, Andrew recovered and decided he wanted to give something back. Upon realizing the bone marrow transplant at Sheffield Children’s Hospital cost £150,000, he set his sights on raising the same amount so other young lives could be saved. District governor Michael Longdon, on behalf of RIBI President 2017-18 Denis Spiller, congratulated Andrew on his inspirational efforts which will help others. He presented Andrew with his award, a glass trophy, a framed certificate, and a cheque for £500 in support of his fund-raising efforts.